Dietary fibre is defined as material of plant origin, resistant to breakdown by digestive enzymes until reaching the large intestine. It increases beneficial gut micro-flora, buffers glucose intake and reduces blood lipid levels. Dietary fibre is not just the overall level of fibre in the diet that is important but also the relative amounts of the main types of fibre, lignin, pectin, cellulose and hemicellulose. Bio-Fibre contains all of the dietary fibre types in appropriate proportions, therefore giving optimal health benefit. What does dietary fibre do? The components of dietary fibre can have a filling effect, reducing hunger; they delay gastric emptying, and slow the absorption of food, thereby reducing post-prandial hyperglyceamia and buffering glucose intake. Dietary fibre components help maintain healthy functioning of the gastrointestinal tract, by decreasing intestinal transit time, assisting in the removal of toxic substances and increasing beneficial micro-flora in the large intestine. Dietary fibre components also help maintain healthy blood lipid levels by binding to (and promoting excretion of) cholesterol and bile acids. Soluble and insoluble fibres from sugar beets and citrus peel, anti-caking agent: polivinylpyrrolidone, bulking agent: Microcrystalline cellulose, ant-caking agent: Magnesium stearate, Firming agent: Silicon dioxide, glazing agent: hypromellose. Take 4-12 tablets daily depending on the individual and the feeling of well being that is obtained as the correct dietary level is reached. Do not exceed recommended amount. Pregnant or lactating women and those on medication should seek professional advice prior to taking supplements. Nutritional supplements should not be used as substitute for a varied diet or healthy lifestyle. 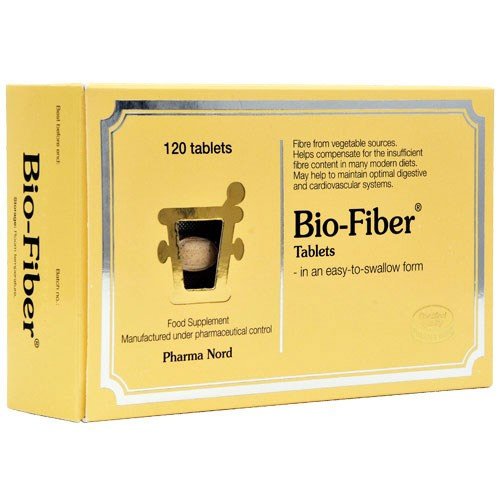 Below are reviews of Pharma Nord Bio-Fiber - 120 Vegan Tablets by bodykind customers. If you have tried this product we'd love to hear what you think so please leave a review. 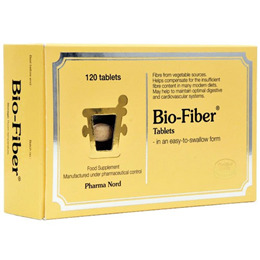 Pharma Nord Bio-Fiber is a dietary supplement without added nutrients. Contains a balanced mix of natural, soluble and insoluble vegetable fibers, derived from citrus peels and sugar beets.